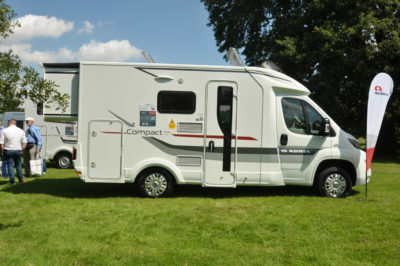 Compact coachbuilt motorhomes too small for you? How about one that adds a slide-out extension when you’re on site? 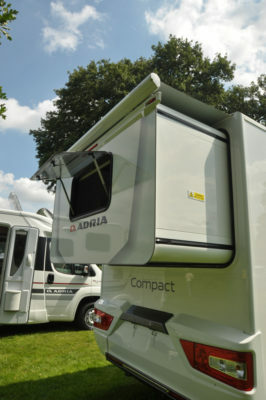 This is the rather radical approach taken by Adria with the Compact Plus SLS. 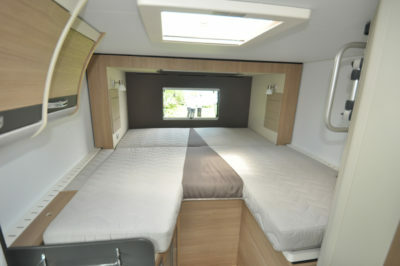 There are two other Compact models from Adria, but only this, the SLS, has such a feature. Needless to say, overall dimensions live up to their naming – the SLS is 5.99m long in “road trim” and just 2.12m wide. At 2.75m, it’s not even particularly tall. But, it’s especially innovative. Before you get too carried away with the pricing, though, consider this. The aptly named Essential Pack is a hefty £2,335. It, too, lives up to its name with what it offers – cab air conditioning, passenger airbag, cruise control, front fog lights, leather steering wheel and gear lever gaiter, ESP and Traction+. So, what we’re really looking at is a motorhome costing £52,325. It certainly looks pretty inconspicuous. As with all Adrias, the coachbuilt bodywork has a tough GRP finish (it’s also easy to repair), accompanied here by flush-fitting windows. They don’t just enhance the look, they’re also less likely to pick up scratches and just might mean less wind noise when travelling, compared to less expensive fittings. There’s also a window in the habitation door (which also comes with a waste bin), while an opening sunroof over the cab and a Heki rooflight over the lounge really helps optimise the daylight getting in. 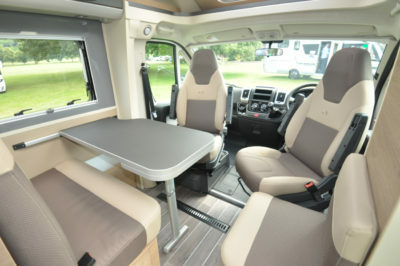 All Compacts are on Fiat Ducato’s Camper chassis, helping to keep overall height down as well as improve the handling. Inside, the all-too-familiar dashboard, with suitable upgrades courtesy of the aforementioned Essentials Pack. If a bit of extra manoeuvrability and economy are your priorities this Compact delivers, especially as it’s now powered by more environmentally conscious Euro VI engines. 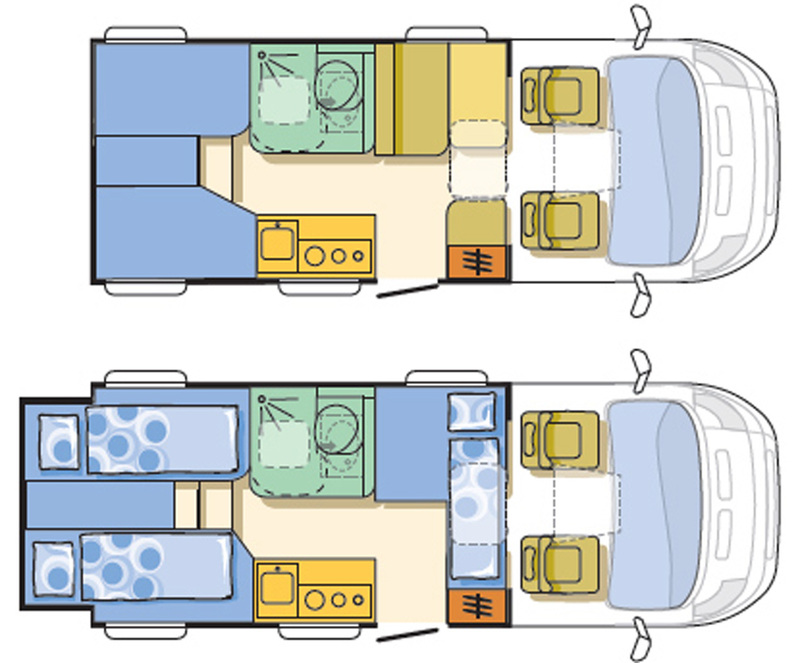 For most motorhome buyers, though, it’s about what’s under the roof rather than the bonnet. And it’s all rather neat here. A lounge in a motorhome like this is never going to be the biggest. Nevertheless, you could feasibly seat five around the extended table, thanks to the swivelled cab seats, rear double seat and an inward-facing single seat. The washroom is beyond the rear travel seat. 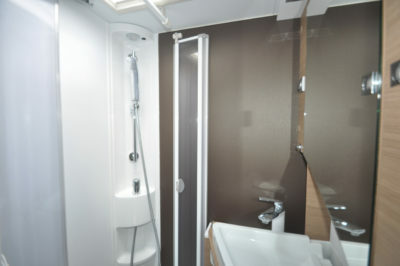 There’s space in here for a swivel-bowl toilet and a shower area with slide-around doors. 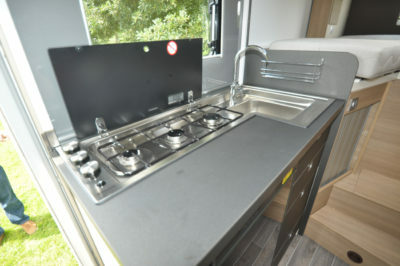 Mirrors hide the neat fold-down sink and vanity unit, plus there’s a handy clothes drying rail and a rooflight for ventilation. The kitchen lives up to the compact name, too. A Dometic fridge is under a three-ring hob and sink arrangement that’s set back to allow an essential little bit of worktop in front of it. 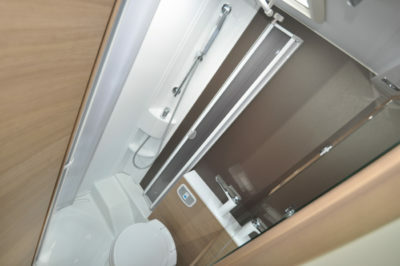 Storage is always going to suffer in such a small coachbuilt, but credit to Adria for what it offers – not least the wardrobe in the nearside bed base and the exterior-access garage space under the bed area. And the all-important slide-out? The extension has an electrical operation (admittedly, it seemed a tad slow on this early version), but it all seems very sturdy. In the out position, you get twin single beds or you can go on and make a double some 1.98m x 1.68m. Glide the whole unit back in (after re-positioning the side cushions) and the backrests automatically come up as the extension pod. A big advantage of all this is the lounge can be left in situ – ideal for couples where one is an early riser or prefers to stay up later at night. Alternatively, if you want to have a third person on board through the night, the seating here does make up to a single, transverse bed. 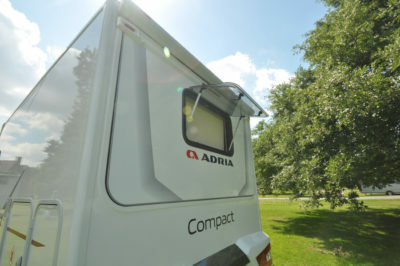 There’s more information on the Compact range on the Adria website www.adria.co.uk. Find out more about our low-cost premiums at our motorhome insurance discounts page. Alternatives: Moto-Trek X-cite EB. See our review of the Moto-Trek X-Cite G Elite for more motorhome slide out ingenuity. 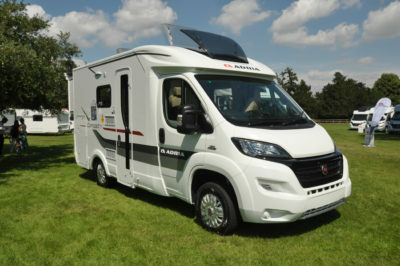 *Motorhome insurance cost based on Adria Compact Plus SLS retailing at £38,490 with electronic immobiliser as standard and Thatcham Cat 1 alarm. UK travel only. Kept on driveway at home at TD9 8ED. Motorhome owners – professionals over 50 years old with no claims, convictions or health conditions in last 3 years. 4 years no claims bonus mirrored from car policy and 2 years motorhome driving experience. Members of motorhome club doing less than 5000 miles annually. £300 excess applies. Premiums include insurance premium tax at 9.5% and are correct at 20.9.16. Cookers with ovens can be retro fitted easily if required, saying its a deal breaker is nonsense also having a cooker stinks the place out better to use a small portable sealed cooker no stinky smells? You’re supposed to be able to live in your van – but there’s no oven or grill! So you have to go out to eat. Must have been designed by a man.. this was a deal breaker for me.